Whether you're a 3-Gun competitor, a law enforcement officer, or just a regular guy or gal looking for an easy way to carry your things, this case is loaded with features to serve your needs. This bag includes a large external pocket with pistol and magazine retaining bands, a smaller external pocket for targets and accessories, and a main compartment with a padded divider to separate two long guns. The .375 inch thick cushioning material is made up of closed cell foam which is not only quite dense but doesn't absorb moisture so that your firearms and optics will be amply protected from impact and rust. The main compartment of this case measures 41 inches long, 11 inches wide, and 3.5 inches thick and will accommodate most rifles and shotguns with mounted scopes. 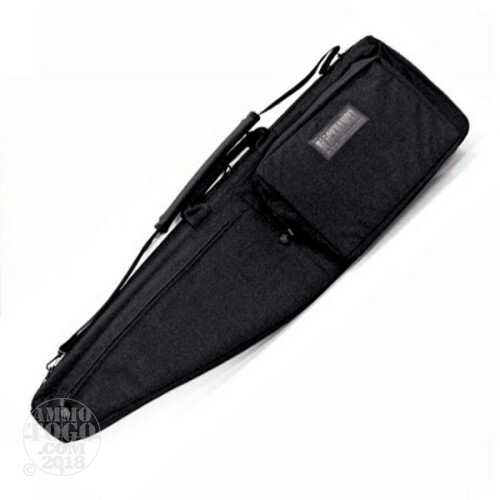 In addition, the zipper of the main section can be completely opened so that the bag can be used as a padded shooting mat in the prone position. The entire case is wrapped in 1000 denier nylon which will resist cutting and ripping over years of rough use. This case includes a removable shoulder strap with anti-slip pad as well as a traditional nylon handle if you prefer to carry "briefcase" style.